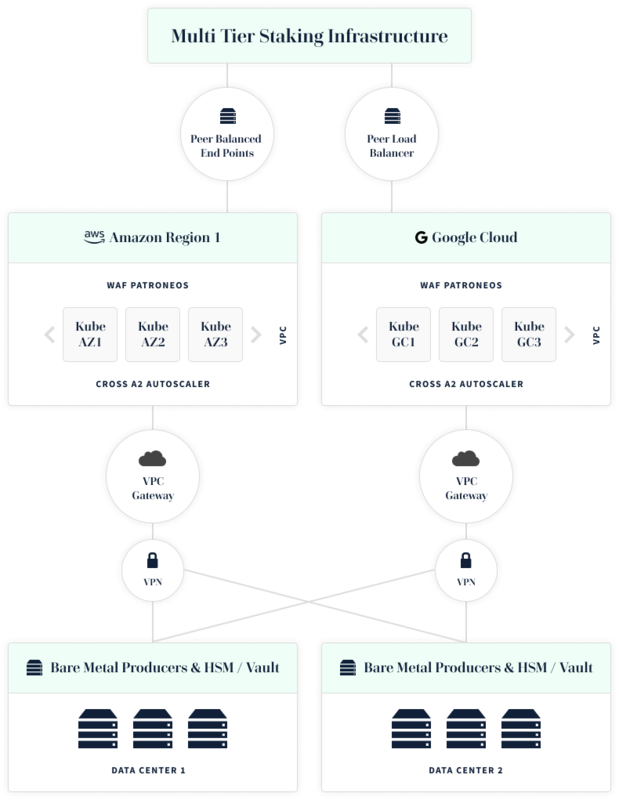 Staked nodes are deployed in a multi-tier signing and listening cloud configuration that combines geographic diversity and redundancy across on premise data centers and cloud providers. Google’s Kubernetes container orchestration is used to achieve near-infinite scale, self-healing and hardware decentralization. Staked takes extreme measures to ensure malicious actors can’t impact our block production and validation operations. Signing servers responsible for producing and signing blocks are firewalled and only able to communicate with listening servers, and secured in geographically distributed data centers with full-time physical security, monitoring and access controls. Hardware signing modules are used for key management wherever possible, otherwise secure vaults are used. In the event our servers are hacked or someone gets physical access, hardware signing modules prevent key loss. Staking is a non-custodial process whereby stakeholders are able to delegate their tokens to validators while retaining control of their private keys. Staked does not custody customer holdings ensuring that in the unlikely event of a hack, customers funds are never at risk of being stolen. Staked employs industry best practices around internal controls to guard against abuse. Our offices do not store keys or contain anything of value. All private keys are secured offsite. All remote access by employees uses public-key authentication. No passwords or other phisable credentials are used. Multi-sig technology is used to secure against attacks and prevent internal abuse.